Cumbernauld United continued their winning streak with a comfortable 2-0 victory at Darvel - their sixth win in six trips to Ayrshire this season. It was a fifth victory on trot for Andy Frame’s side on a day which, despite the very wet conditions, couldn’t have started any better. In the opening minute an excellent Kieran McAleenan through ball split the Darvel defence to allow Conor Scullion, in space, to chip the ball superbly over the advancing home keeper David Markey. On the extremely heavy pitch United were playing some excellent football as they pressed the Darvel defence in search of a second. Paddy McCabe continued his recent fine form down the left and in one foray he went past three men only to be foiled by the alert Markey. Full-back Alan Benton was also taking the eye and a surge up the right wing saw the big man’s finishing shot clear the crossbar. A lovely pass from the Cumbernauld defender then gave Scullion a chance but this time the forward’s effort was off target. It was all United and when Darvel did manage to get upfield they found United skipper Paul Murphy in superb form, ably assisted by the consistently immaculate Tony Stevenson. United needed a second goal to assert their authority though and got it via the penalty spot, McAleenan converting after he himself had been fouled. 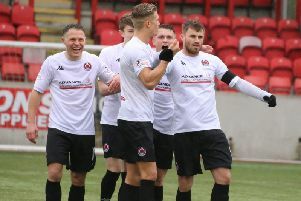 Long-term injury victim Chris Lennon was warmly welcomed by the Cumbernauld fans when he came on as a substitute in the second half and in the 65th minute showed his class when his cheeky back-heeler was cleared off the line by a Darvel defender. Another Lennon effort was also stopped on the line with the keeper beaten. There were numerous free kicks from both teams as the heavy pitch took its toll but United never looked in trouble and could have added to their goals tally. Next up for Cumbernauld next Saturday is a potentially vital home clash with promotion rivals Arthurlie. Kick-off at Guy’s Meadow is 2pm.